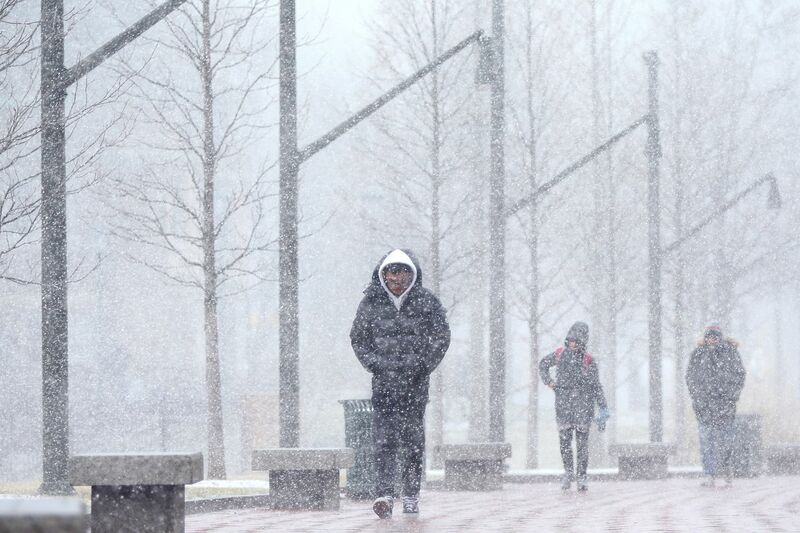 Pedestrians are caught in a recent snow squall on the campus of the University of Pennsylvania. Forecasters warn that the Tuesday morning commute could be adventurous with snow and ice. Having experienced its biggest snowfall of 2019 (for real), the region might be about to experience something more disruptive. The National Weather Service has hoisted a winter weather advisory for the entire region through 6 p.m. Tuesday and a winter storm warning for upper Bucks and Montgomery Counties. This is my first Philly winter. And this weather is crushing my soul. The forecasts are calling for 1 to 3 inches of snow in and around the city, followed by ice through the morning commuting hours and perhaps a daylong icy lacquering farther to the north and west. “It definitely could be ugly across the region,” said Nicholas Carr, a meteorologist at the National Weather Service office in Mount Holly. With a winter storm warning posted for northwestern New Jersey for up to 6 inches of snow, followed by ice, and an advisory in effect for the rest of the state save for Cape May County, Gov. Phil Murphy declared a state of emergency. Snow overnight is expected to mix with sleet, and then change to rain and freezing rain during the day Tuesday. But with temperatures near 32, forecasters warned, north and west of Philadelphia it could be a close call between liquid rain and ice. Philadelphia public schools and archdiocesan schools in the city have announced two-hour delays for Tuesday, as did many other school districts and schools in Southeastern Pennsylvania and South Jersey. The remnants of cold high pressure have added a dangerous element of stubbornness to cold air at the surface. “It’s going to be like pulling teeth to get temperatures above freezing,” said Dave Dombek, a senior meteorologist at AccuWeather Inc. The growing power of the February sun — the region is gaining two-plus minutes per day — should promote melting on paved surfaces even with temperatures at freezing. However, an overnight accumulation of snow and sleet could add a refrigerant effect and slow the melting, at least for a while, Carr said. He said he would expect temperatures to be above freezing in and around Philadelphia by late morning or early afternoon, but it could be a long, slow climb away from the city, particularly toward the Lehigh Valley. In what has been a generally snow-deprived winter, this has been an active week. Officially 2.3 inches of snow was measured at Philadelphia International Airport from the snow that fell from Sunday into Monday morning. That was the biggest total of 2019, and the most since Nov. 15. It brought the seasonal total to 9.7 inches, or 4.3 inches below the normal through Feb. 11. Higher totals were reported to the south and east, with 3-inch and 3-plus accumulations common in central and southern Delaware and at the Jersey Shore. After the precipitation, another warm-up is due, with temperatures heading into the 50s by the end of the workweek. That has been the leitmotif of the winter.